WASHINGTON, D.C. -- On 10 hot-button issues, President Donald Trump gets the highest approval ratings for his handling of terrorism (46%) and the economy (45%). His lowest ratings are for healthcare policy (28%) and relations with Russia (30%). Trump's frosty relations with the news media meet with approval from 34% of U.S. adults. These results are based on a June 7-11 Gallup poll. Trump, at 38% overall job approval in the same survey, does not enjoy majority approval on any of the topics Gallup surveyed. The president's high-profile commentary on terrorism following attacks in the United Kingdom and Iran in recent weeks perhaps contributed to his relatively strong approval on this matter. And he may be benefiting from a relatively strong U.S. economy in his approval ratings on that issue. Trump doesn't score as well on the environment, at 32% approval, following his decision to withdraw the U.S. from the Paris climate accord. His 34% approval rating for relations with the news media comes amid a barrage of tweets from the president about the "fake news" media and his labeling of them as the "enemy of the people." Gallup previously measured approval of Trump's handling of three issues -- the economy, foreign affairs and immigration -- in February. On all three, his approval ratings are essentially the same now as they were four months ago. As would be expected, Republicans and Democrats assess Trump's performance differently on each of the 10 issues. No more than 15% of Democrats approve of Trump on any of the issues tested. No less than 61% of Republicans approve of Trump on any issue, with a high of 80% approval on terrorism and the economy. Less than a majority of independents approve of Trump on all issues, ranging from a low of 24% on healthcare to a high of 48% on terrorism. With Trump's overall job approval rating in the high 30s, it is unsurprising that Americans would not rate his handling of any specific issues highly. Yet it is instructive to see which issues rate better than others. While there have not been any major acts of terrorism on American shores during Trump's presidency, there have been several attacks in Europe and the Middle East -- and many Republicans may be drawn to the president's direct statements on the matter. The continued strength of the economy, including job creation, GDP growth and record highs for the stock market, likely contribute to Trump's higher level of approval on the issue. It may be no surprise that Trump earns low marks for his handling of relations with Russia, as the inquiry relating to Russian involvement in the 2016 U.S. presidential election continues and has seemingly intensified. And with Obamacare imperiled by Congress, Americans are not buoyant about the Trump/GOP plan to repeal and replace the Affordable Care Act. Unless the president's overall approval rating begins to rise significantly, it is unlikely that these issue ratings will move much higher in the short term. 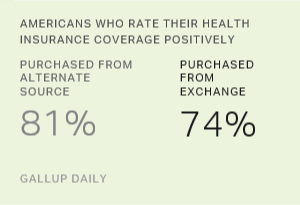 U.S. adults who purchased health insurance through a federal or state healthcare exchange rate their coverage less positively than those who purchased elsewhere.